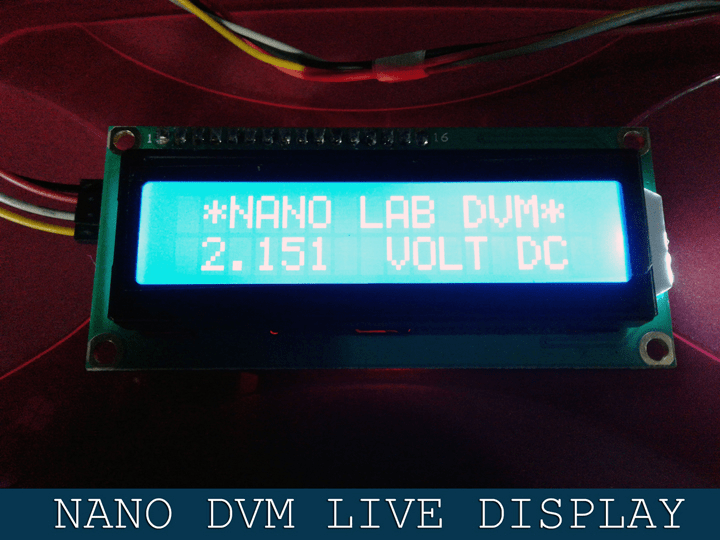 Nano Digital Volt Meter is a microcontroller based simple DIY project for electronics hobbyists and makers. It is a compact digital voltmeter which can incisively measure input dc voltages in 0 to 55V range. The project is built around an Arduino Nano microcontroller board. Another key component is an I2C LCD panel, which is easier to wire up as the microcontroller can talk to the display over a single pair of wires. 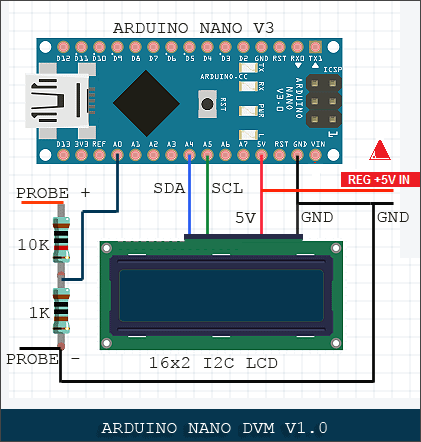 The analog sensor on the Nano board senses the voltage on the analog pin and converts it into a digital format that can be processed by the microcontroller. Here, the input voltage is routed to an analog pin through a simple passive voltage divider, and with the values shown it can measure dc voltage in 0V to 55V range. However, when feeding 55V, the analog pin will be held at its maximum tolerable voltage of 5V. So, it’s better to treat this voltmeter as a “0-48V DVM” unless you want to add an “Arduino Toast” in your breakfast menu! //#define LCDADDR 0x27 // Uncomment for next address, and comment above line! The Arduino Nano can be powered from any 7-12V unregulated dc supply through Vin pin (pin30). You can also use a regulated 5V (> 5V inputted here will fry your board at once) instead as the power supply by applying +5V pin (pin27). According to official documentation, the input power source (USB/Vin/+5V) is selected to the highest voltage source automatically. The prototype was tested initially with a Duracell PP3-size 9-volt alkaline battery. Since the +5V pin of Nano can provide safe current upto 500 mA, the LCD was powered directly from the same +5V (pin27) rail. However, it’s better to use a regulated 5V external dc power supply for the DVM (see figure shown below) if you prefer to use the display with always-on backlight.